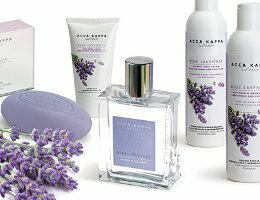 A collection naturally scented with the fresh and delicate fragrance of lavender, evoking images of fields of blue, gently swaying to the rythm [sic] of a warm Mediterranean summer breeze. Additional notes include incense, mint, pink pepper and rosemary. Wish lavender liked me. This seems like it would be more like “fields of headache” for me personally, and I’m a bit jealous of people who do well with lavender. I did terribly with all things lavender, too. You should smell Reverie au Jardin on my skin – absolutely revolting, though I like the way it smells after its been lingering in the cap of the bottle. That being said, I recently received a bottle of Caron’s Pour Un Homme, had dismissed it for a few weeks, but was in need of a good room spray after cooking some chili. The cologne smelled so wonderful in the air, so I tried it on skin and – voila – it worked! This likely due to the fact that the lavender, instead of being medicinal and herbaceous, becomes softer, wrapped in a less-sweet vanilla. That being said, however, it doesn’t mean I hold much hope for other lavenders, but does give me a little more optimism – at least enough to try one out, instead of automatically dismissing it. I am beginning to think that with specific notes it might be a case of “never say never”. Changed my mind about vetiver and might well one day with lavender. LOL at “fields of headache”! I do well with lavender but prefer it more as an ambient scent, or as a bath product rather than for daily wear as a soliflore. I wonder where this line is available? I don´t think I’ll come across this in the near future (getting the Akka Kappa Cedar here in Argentina ammounted to an operation worthy of a Mission Impossible episode) and I liked it… but I am not willing to do the same for lavender. They do sell online…and I’ve fixed the link (which I had entered incorrectly the first time). Ooooo I love all things lavender: lavender flowers, fragrance, soap, sachets, linen spray, chocolate, you name it. I’m on the quest to try all varieties and versions. Will add this one to my list! I really like their products. There is still, I think, a very small store in the grand canal shoppes at The Venetian. I liked their cedar scented products and I will give anything that’s lavender a try.